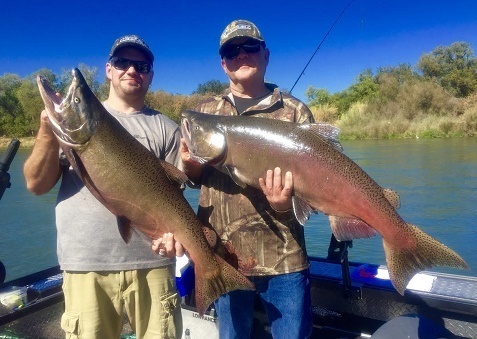 Chris and Harold of the Yuba City area hold up two 22 pound kings they hooked at the exact time while fishing with Jeff Goodwin's Guide Service on Sunday. 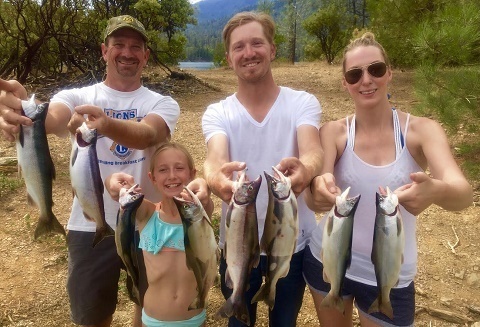 Last week's Sacramento River King salmon fishing enthusiasm has stalled and and has turned into a state of panic for Shasta county salmon anglers. 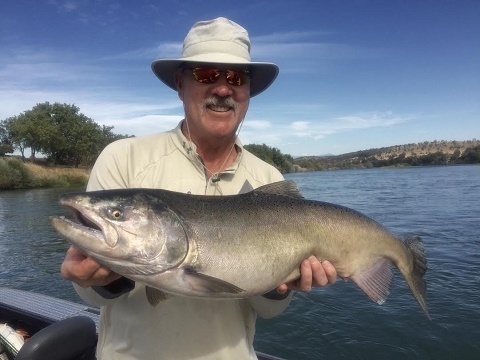 What seemed to be an increase in bites and salmon caught near Cottonwood, Ca. has once again dropped off and everyone is struggling to even get a salmon per rod during a full day of fishing. I know guides on the river who have been working the river for 30-40 years and even they are struggling. The fish just aren't here. We have yet to see any real push of salmon this past week, and most days, its rare to even see more than a few salmon roll below the Barge Hole. I've been fishing salmon trips most days and have been averaging about a fish per rod. The plug bite has been slow for me, but some guys are getting the plug bites. My eggs have been getting bit every trip out so that's been my go-to method all week. 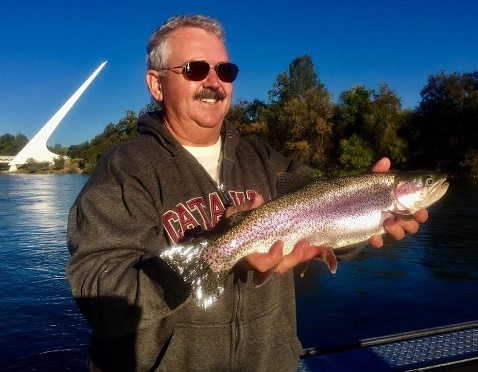 The Sacramento River steelhead fishing has been good and I've been running a few of those trips still as well. The plug bite has been consistent, but I'm struggling with the spoon bite. There is a lot of grass and debris in the river now and thats making it very hard to keep any baits down for any length of time. I suspect it will continue to be this way into winter when they reduce the river flows to winter levels. All in all, its still worth a trip out on the river for King salmon and steelhead. There are still some great salmon and steelhead being caught. Who knows, you might hook into a big King while steelhead fishing like we did today. I'm not lost of any or all hope for the 2016 salmon season, and there is still some hope that we will have a descent short season ahead before the last of this small run swims up to the Barge Hole before swimming to their final destination at Coleman National fish hatchery. Whiskeytown Lake Kokanee still biting!